The Take Flight Leadership Retreat is a full weekend leadership experience designed to build relationships between student leaders on campus. This year, Take Flight will be held August 9 - 11, 2019, at Wilderness Ridge in Camden, OH. The Take Flight Leadership Retreat is a full weekend leadership experience. The retreat will consist of interactive team building and experiential-based activities along with workshops and presentations designed to challenge and engage students in various ways. This year's curriculum will be based on the Social Change Model. This retreat will consist of personal leadership development, team building experiences, networking, and hands-on planning of previously submitted projects. Students will use what they have learned at Take Flight and the student/staff connections they have made to create an action plan for the 2019-2020 school year. 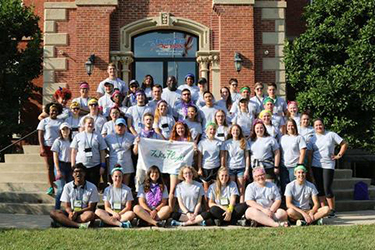 2019 Take Flight Participant Applications are NOW OPEN on Engage! Click here to apply before April 19th, 2019 at noon!